Roland Juno DS88 Review - Is this keyboard wothy for your money? Today we are going to dive deep into a Roland Juno DS88 review. Though not as prominent a company as, say, Yamaha, Roland Juno is still infinitely capable of making good stuff. As far as we are concerned, the DS88 is a prime example of this. Now, that said, that doesn’t mean that it is right for you. Deciding on the right instrument requires an up close and personal look. Fortunately for you, we are in the business of providing exactly that. We have gone over every inch of this instrument to determine if it is right for your needs. Our findings have been assembled in the guide below. Read on for your Roland Juno DS88 review! An informed decision requires a deep understanding of the instrument in question. That in mind, here are some key features that will help acquaint you with the Roland Juno DS88. If you are traveling to gigs a lot you know how important it is to have something that is portable. While most keyboards are going to be more portable than most acoustics, some are definitely easier to transport than others. 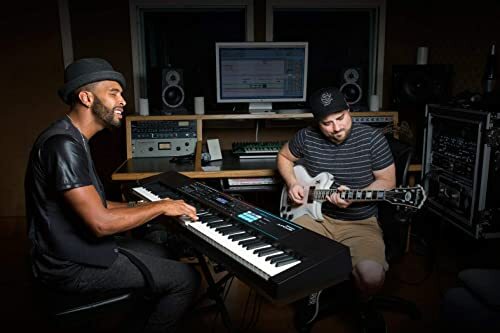 The Roland Juno has been optimized for musicians on the move. It features a lightweight, compact frame that will be easy to move in and out of vehicles. Even better yet? It is also capable of running on batteries for maximized mobility during gigs. And of course, when you are playing at home, you can hook it up to a power source. 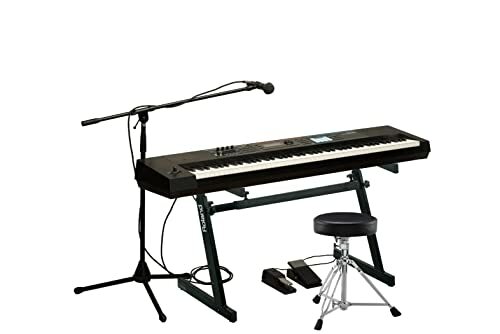 If you need a keyboard that can get around town easily, you are going to like the Roland Juno! If you are an experienced musician, you don’t need us telling you how important a good keyboard is. Since the keys themselves are the only part of the instrument (pedals excluded) that you actually make contact with, it makes sense that there should be a keen focus on their quality, right? In the case of the DS88, there certainly has been. This piano features a fully weighted eighty-eight key set up that will appeal to musicians of every skill level. For those that don’t know, a “weighted” key means that it has been made to resemble an acoustic setup. On acoustic pianos, the keys naturally provide resistance when you press down on them. This is not the case with electric keyboards. Without intervention, an electric keyboard key will feel very light. The problem? It makes it hard to transition to acoustic when the need presents itself. The bottom line is that you want a keyboard with some weight to it, and you get exactly that here. It is also worth noting that the keys have been designed to replicate the feel of ivory. One of the main complaints of keyboard keys is that they often feel like plastic. That being the case, “ivory feel” keys are a nice feature to have. One of the big benefits of going with a keyboard is that you get lots of sound options. That is certainly the case here. The DS88 has access to the entire DS Juno sound bank, which includes hundreds of different samples. The numerous sound options give you plenty of space to get creative. You can experiment with the many different piano tones or mix it up with a different option. There are loads of different choices out there for you. Last but not least, the DS88 also makes it as easy as possible to edit and manipulate your samples. It features a simple onboard interface of knobs and sliders for quick adjustments. The idea is to empower artists to get creative without encountering the need to pause. With this setup, you can record, and adjust your samples in real time, all from keyboard controls. Whether you are a serious composer or someone that just likes to experiment, this feature will come in handy. Of course, even with all of these things said, the Roland Juno DS88 does have its issues. The biggest problem that we noticed was the speaker quality. Relative to other options in this price range, we found the sound output of the DS88 to be a little bit lacking. If you are a beginner, you probably won’t really notice the disparity. However, beginners also aren’t really this keyboard’s target audience. 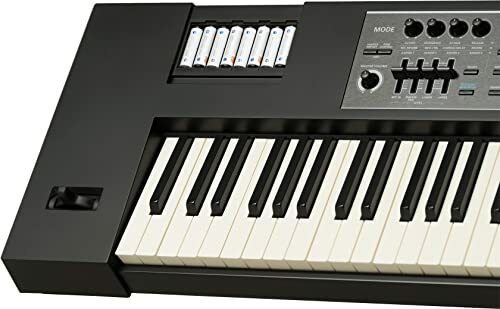 This is supposed to by a musician’s keyboard. Established musicians probably will care quite a bit about output quality. One thing to keep in mind is that for gig purposes, the D88 does sound pretty good over external speakers. Granted, in an ideal situation, there wouldn’t be problems with the sound quality at all. Still, it is nice to see that there is a solution. This aside, there is little to complain about regarding the DS88. Our review is just about over. We have gone over every triumph and flaw of this instrument, and you will soon be tasked with making your decision. Before you decide though, it may help to review the important pieces of the Roland Juno one last time. That in mind, let’s take a look at some pros and cons! Now that you have seen what the Roland Juno has to offer, it is time to get serious about your decision. Are you going to be taking this instrument home? If so, we certainly understand why. For a traveling musician on a moderate budget, it doesn’t get much better than this. It’s feature-rich, very portable, easy to store, and for the money, it performs really well. What’s not to like, right? There are higher-end options out there, but the truth is with those options, you pay lots more to get quality that is pretty similar. If you like what you saw here today, the Roland Juno may very well be for you.